Pakenham Watermill has found a farm in Norfolk which is growing spelt, after our previous supplier stopped production. Milling of this increasingly popular wholemeal flour has now been resumed and it can be bought from the mill or from our usual local retail outlets. Spelt is genetically related to wheat and there is evidence of it being grown in the middle east as long as 7000 years ago. It has generally been replaced by modern wheat varieties which are cheaper to produce, but interest has revived in recent years. 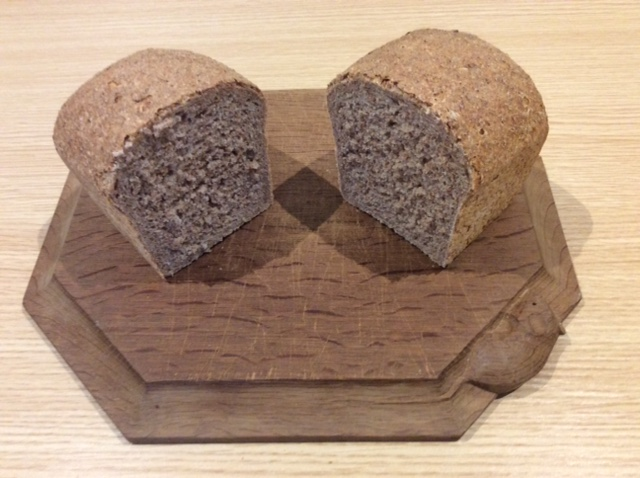 It can be baked in the same way as wholemeal wheat-flour using yeast, but the bread has a rather different texture and flavour which some people prefer. It is also thought to be easier to digest as the gluten has a different composition. It does still contain gluten however, and is therefore not suitable for those who are gluten-intolerant. 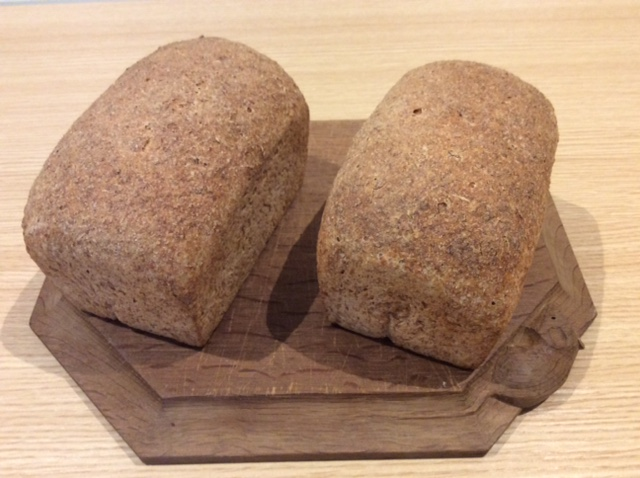 The pictures show two loaves made from 100% of the new Pakenham wholemeal spelt flour, and one loaf cut open to show the crumb. One of the milling team at Pakenham, John Wilkin, has been experimenting with baking sourdough bread for some time. Sourdough bread consists only of flour, water and a little salt, with no added yeast, relying instead on the natural organisms in the flour to drive the fermentation. The process is slow, but the bread has a richer flavour and smell, with an open texture. John’s early results tasted good but looked miserable, as they hadn’t risen properly. However, a friend suggested baking in a pre-heated heavy casserole dish, keeping the lid on. This has produced a spectacular improvement, which John thinks is due to trapping the steam around the loaf, and a more even all-round heating, similar to a brick oven. The loaf pictured was made with a half-and-half mixture of Pakenham wholemeal and strong white flours. Every year the BBC’s Countryfile Magazine runs a competition to celebrate the best of British countryside and to shine a light on places, projects and people who are doing great work. Readers suggest their favourite places all over Britain in eleven different categories such as National Parks, beaches, villages, country pubs and wildlife reserves, etc. A panel of judges goes through them all in a long and detailed process to select a shortlist of five in each category, then it’s back to the readers to vote for the winners. To our great delight this year the judges shortlisted Pakenham Water Mill as one of the top five in the ‘Landmarks’ category alongside more famous places like Hadrians Wall, and although not surprisingly the Roman wall came out top in the final voting, Pakenham came in third! This is great news for our historic Suffolk watermill and a recognition of the work done week after week by a team of about forty dedicated volunteers who keep it running, mill the stoneground flour, maintain the grounds, run the lovely tearoom and shop and together make it such a popular place to visit. Turn left over the bridge at the rear of the mill and you will come to the ‘Wildlife Area’. This area had become very overgrown and has been redeveloped over the last two years to give safe access to an interesting site. The aim is to encourage wildlife to populate the area and to give visitors ideas about how they might develop parts of their own gardens to improve the habitat for plants and animals. The area includes a small pond which attracts insects and amphibians. There are several wood piles, some of them old and rotting, some newly cut. These attract insects and birds. There are dense brush areas and swathes of long grasses. Access to the different areas is by mown paths. There is a ‘wildlife hotel’ which has been converted from a brick barbeque. It has many levels and a wide choice of habitats. Small sheets of corrugated iron have been placed around the site. These warm up in the morning sun and are a haven for voles, slow worms, toads and numerous insects. The sheets can be lifted carefully to observe the ‘residents’. The site lacked sunlight as it was dominated by very old large wild plum trees. These have been trimmed back and rotten branches have been moved to make the site safer and to allow in much more light. The remaining trees should now have a new lease of life. The white plum flowers in spring attract bees and other insects. The small yellow ‘mirabelle’ plums give autumn and winter food for many animals. The dense grass growth was cut down in places to allow space for wild flowers to grow. In 2017 over forty species were counted. They include primroses, bluebells, poppies, arum lilies, cornflowers, corn marigolds and oxe-eye daisies. Some less common plants include viper’s bugloss, corn-cockle, and valerian. A few non-native plants have appeared and been allowed to grow e.g. buddleias which are very attractive to bees and butterflies. The mill volunteers have created a path on the South-East side of the mill pond. This will create a circular walk for visitors, so they can go all the way around the mill pond. With some interesting old trees the kids are sure to love exploring along this nature walk, while adults will enjoy the views it offers. We are pleased to announce that we are now able to accept payment by debit and credit cards at the mill. You can now pay for mill entry, refreshments in the tea room, purchases in the gift shop – and of course flour – with Mastercard and Visa debit and credit cards. So even if you have no cash in your wallet you can still come along and have a great day at Pakenham Water Mill!